“We and/or “Us” means AirSeaLand Photos. “You” means the person using this website. You will be deemed to have accepted these terms and conditions unless you notify us to the contrary and return all the Images to us within 5 days of receipt. No variation of these terms or conditions shall be effective unless agreed in writing. “Image” means any item which may be offered for the purposes of reproduction (including where appropriate a Digital Image). The Images are submitted on loan at your request, on approval only. Our delivery note lists the Images delivered to you, which shall be deemed to have been received complete and in good condition, unless we receive notification of any discrepancy or damage within 48 hours of receipt. Images belong to us. They are your responsibility from the time we despatch them until we receive them back. You are urged to take out insurance to cover the total value of the Images delivered. You must pay a non-refundable service fee to cover administrative costs and despatch of Images on each submission and resubmission of Images whether or not reproduction rights are required or granted. We will deliver Images to you by the most appropriate safe method which affords proof of delivery, and may invoice you for the delivery costs. "Return Date" is the date by which the Images must be returned as specified on the delivery note or licence. If no date is specified, the Return Date shall be four weeks from the date of the delivery note. You must pay the rental fee specified in the delivery note until we receive the Images back. Payment of the rental fee does not entitle you to retain any Image after its Return Date. You must return Images to us by a safe method which affords proof of delivery. You must arrange adequate protection for Images in transit. You must enclose a delivery note detailing and totalling the returned Images and must send a copy of that note by separate post, fax or email. You must immediately notify us in writing of any loss or damage. You must pay us compensation for each Image lost or damaged at the rates specified on the delivery note which are a genuine pre-estimate of the loss which we will suffer. Any Image returned without its mount or with its caption or other mount data missing or defaced, may incur a replacement charge at the rate set out in the delivery note. Payment of compensation does not entitle you to any additional rights in the material. An Image subsequently found must be returned immediately. If it is undamaged you will be credited with any compensation paid less a rental fee at the rate set out in the delivery note from the Return Date to the date the Image is returned. Such credit will never be less than 20% of any compensation paid. The reproduction by whatever means of the whole or any part of any Image (including, without limitation, slide projection, artist’s reference, artist’s illustration, layout or presentation of Images) is strictly forbidden without our specific written permission. You must inform us of your proposals as to when and how an Image is intended to be used. We will then consider whether we would wish to grant a licence and, if so, on what terms. our invoice relating to the grant of such right is fully paid. Any reproduction before payment of the invoice or outside the terms of any licence constitutes an infringement of copyright and also a breach of this Agreement entitling us to rescind and claim damages. You must indemnify us in respect of any claims, damages, costs or expenses we incur arising from any reproduction of any Image supplied to you. You must satisfy yourself that all necessary rights, model releases or consents which may be required for reproduction are obtained and that the use of any image is not obscene, indecent, libellous or unlawful. We make no claim or warranty with regard to your use of content, names, text, people, trademarks or copyright material depicted in any Image and you will indemnify us in respect of any claims, damages, costs or expenses we incur arising from the use of any Image supplied to you. non-exclusive reproduction rights for single use only in the United Kingdom. A single use means a reproduction in one size for one edition of a single publication, published in one language only, strictly limited to the use, period of time and territory stated in the licence, personal to you and not assignable by you to any third party. If we agree that you may license the use of any Image to any third party, you shall enter into an agreement with such third party to ensure that they are bound by licence terms restricting printing, copying, networking, multiple access or other use of the Images to personal use only, forbidding the assignment, resale, rental and lending of the Image and ensuring that credit is given to us and the author. You must credit us and the author as specified by us every time an Image is used. If you fail to credit the Image an additional 50% of the original licence fee will be payable. Images shall not be altered or manipulated, added to, or have any part deleted without our prior written consent. You must provide us on publication with at least one complimentary copy of any publication in which the reproduction of the Image appears. You acknowledge that Images are our valuable property, as are any digital images created from the Images (" Digital Images"). Each Digital Image created by you shall be recorded and labelled with the Image reference number used by us and our copyright credit information as an integral part of the image file, and held on an electronic database under your sole possession and control. Unless otherwise agreed, any Digital Image you create must not be greater in size than 640x480 pixels, 72ppi. Any use of the Digital Images shall be in a format designed so that it will not be possible to alter, manipulate or adapt any Digital Image in any way during the normal course of using the product. You agree to destroy all Digital Images including any pre-press or pre-production copies of the Images and any copies or records of the Images held on a database within 90 days of the date of receipt of the Images or completion of the maximum production run, or expiry of the licence term, whichever is later. While we take reasonable care in the performance of this agreement, we shall not be liable for any loss or damage suffered by you or by any third party arising from use or reproduction of any Image or its caption. Damages for any other breach shall be limited to the licence fee paid by you. You must pay our invoice within 30 days of issue. However, in the case of newspaper, periodical and broadcasting use only, if we agree in advance, you may pay by the end of the calendar month immediately following publication or use, or within six months of the issue of our invoice, whichever is sooner. If you do not pay in accordance with these terms then we may at our option rescind this Agreement and recover damages, or charge interest at the rate prescribed by the Late Payment of Commercial Debts (Interest) Act 1998 from the date payment was due until payment is made. fail to perform any of your obligations under these Terms and Conditions within 28 days of our giving you notice to comply. In the event of termination, all rights granted will immediately revert to us and any further exploitation of any Image shall constitute an infringement of copyright. Any publication right (as defined in the Copyright and Related Rights Regulations 1996) arising from your use of any Image shall vest in us and you hereby assign all such rights arising to us. Our failure to exercise or enforce any of our rights will not be deemed to be a waiver of such rights nor bar their exercise or enforcement in future. Should any disagreement arise between us, we shall, if we both agree, first try to settle it by a mediation procedure recommended by the BPLC. These Terms and Conditions shall be governed by the laws of England and Wales and the parties agree to submit the jurisdiction of the English courts, such jurisdiction to be exclusive, save for infringement of copyright or non payment of our invoices where it will be non-exclusive. However, if our business address specified overleaf is in Scotland then these terms and conditions shall be governed by the laws of Scotland and the parties agree to submit to the jurisdiction of the Scottish courts, such jurisdiction. Innocent As agreed by BAPLA, AOP, NUJ, MPA and the BFP. Searching - Find the assets you need using comprehensive search parameters. Category Search - The category search function can be found in the Categories tab. Viewing Assets - Search results and previews. Lightbox - Create and save collections of assets then e-mail to colleagues and other 3rd parties for consideration. Downloading Assets - Finalize choices, confirm usage details and download (high resolution) original source files for immediate use. To find assets by keyword type words into the search bar at the top right of the screen and click Search. Click 'Search' to begin your search. Tick the desired option(s) and the assets meeting your criteria will automatically display. Search results are displayed dynamically to fill the window. The current page number is shown in the menus bar within navigation buttons to move to the previous or next page. There is also an option to select which results page to go directly to. When an asset is added to a lightbox or basket the + of the icon will change to a tick and the asset will appear in the sidebar to the left of the screen under the relevant tab. Users can alternate between Lightboxes using the pull down menu in the sidebar. Assets may be deleted from a lightbox or basket from within the sidebar by clicking on the icon marked with an X.
Click on the thumbnail to go to the preview and see details of the asset, including the keywords attached to the file. Use these to broaden the search using one or more of the keywords, or to narrow the search (search within a search) by checking the appropriate option above the keywords and clicking on Search after ticking the selected keyword(s). Images and videos can be previewed here along with additional information eg. the pixel dimensions of any image files selected, the image size in MB uncompressed and the size at which the image will reproduce at 300dpi. Click previous or next to navigate through the search results or lightbox being viewed. Multiple lightboxes can be created and will be automatically saved for subsequent visits. They will remain until they are deleted. Email - Email a lightbox - enter an e-mail address, add notes and send. The Basket allows the user to enter relevant image usage details and download the assets from the site. Clicking 'Remove' will remove an asset from the download basket. Users will receive an email confirmation of the assets downloaded. Here you will be required to agree to the terms and conditions of use prior to downloading any assets and will select the required size. 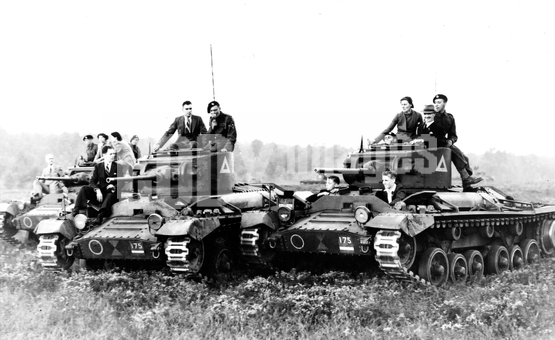 Caption: Weapons - Land - Tanks - Medium - Valentine MK III Exercise Munition workers employed in the production and construction of tanks are entertained by the Army. AirSeaLand Photos takes great care in safeguarding your private personal information that you may provide us with in the course of your contacts with us. This Privacy Statement details the information we collect and the manner in which it is used. We maintain physical and procedural safeguards to protect any non-public personal information provided to us. This website contains links to other sites. Please be aware that AirSeaLand Photos is not responsible for the content or privacy practices of such other sites. It may not be immediately apparent that you are leaving our site and we suggest you read the privacy statements of each and every web site that collects personally identifiable information. This privacy statement applies solely to information collected by AirSeaLand Photos web site. When you visit our website, we collect information about your visit. We may collect your IP address, browser type, domain name, and we log the length of time of your visit and the number of times you visit our site. This information is used in the statistics for site monitoring and improvements, and does not include personal information such as name, email address, etc. If you send an email message that includes personally identifiable information, e.g. in an email message containing an enquiry, we will use that information to respond to your enquiry. Please note that email is not necessarily secure against interception across the internet. N.B The image sizes shown in this illustration are provided to you only as a guide. We recommend that you take advice from your designer before purchasing your image.